4. by removing the charger (in "POWER ON/ACTING DEAD" state only). There is a delay of 100 us between the expiring of the watchdog and reaching the power off state. During this time CCONT does not accept charger detection nor power on interrupts, i.e. if user generates these interrupts during the 100 us delay they don't have any effect and the phone stays off. Watchdog initiated power down is typically a result of a phone malfunction, like SW errors, when the CCONT watchdog is not reset by SW. Because of this the watchdog initiated power down can be entered in any operational state. Watchdog can be disabled by HW means by connecting the CCONT WDDisX pin to ground. Technical Documentation phone powers off. 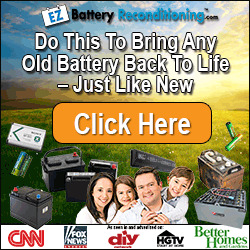 The power down procedure can be entered from any operational state. A brutal way for power down is to remove a battery when the phone is powered on. The phone gets warning of this by lOw_BATT detection signal which is connected directly to MAD (CARDDETX) . When MAD realizes that battery is being removed it has 2 - 4 ms time to power down the SIM interface in order to protect the SIM card. MAD2PR1 forces down the SIM reset, SIM clock, SIM data and SIM power in this order. This section describes the main clocks in the system. The system clock in the HD947 phone is 13 MHz. It is generated in the RF VCTCXO circuit. The clock frequency is controlled by AFC which is in COBBA_GJP. The 13 MHz sine wave signal goes to MAD2PR1 RFC block which generates a square wave signal from the sine wave signal. MAD2PR1 provides the clocks to its internal system components from the 13 MHz system clock. The MCU receives 13 MHz clock. For the DSP the MAD2PR1 system logic provides an 13 MHz clock which is up converted by the DSP PLL 52 MHz. MAD2PR1 generates also the clocks to its own system logic blocks. The real time clock logic consists of RTC logic in CCONT, and the 32 kHz crystal. In normal situation the real time clock takes the power from the switcher output. When the cutoff voltage is reached the switcher continues to operate at least 24h, providing supply for the RTC. 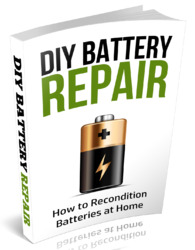 In case the main battery is removed the RTC is powered by the output capacitors on the switcher until they are drained and the RTC loses it's timing. The time must be set again upon power on. CCONT generates a 32 kHz sleep clock signal which is used as a time base during the sleep state. 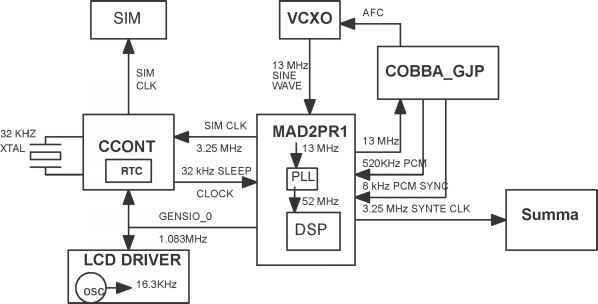 The 32 kHz clock signal goes to MAD2PR1 which has the sleep state counter. Sleep clock output to MAD2PR1 is active always when the phone is powered on. Cobba_GJP uses the 13 MHz clock,COBBACLK, coming from MAD2PR1 as a system clock. The 520KHz PCM codec master clock, PCMDClk, and the 8 KHz PCM codec frame synchronization clock, PCMSClk, are the two PCM codec related clocks going from COBBA_GJP to MAD2PR1 . The master clock is used to clock the transfer of the PCM samples between COBBA PCM codec and MAD2PR1 DSP. The frame synchronization clock frequency is used to indicate the sample rate of the PCM samples. A 3.25 MHz synthesizer clock, SynthClk, is used to load the synthesizers. The clock is generated in MAD2PR1 and it goes to SUMMA in RF. MAD2PR1 provides the SIM clock, 3.25 MHz, to the SIM card via CCONT SIM interface. The MAD2PR1 general purpose serial output, GenSIO_0, is a 1.083 MHz clock which is used in the communication between MAD2PR1 - CCONT and MAD2PR1 - LCD driver. The LCD driver IC is equipped with an internal free running clock oscillator of typically 16.3 KHz used for internal logical operation and divided into the display frame frequency of 80 Hz.